Bimal Gurung today said he would quit as the GTA chief executive "within 10 minutes" if the under-construction Rama Krishna Siksha Parishad ( RKSP ) Higher Secondary School, opposite the Darjeeling Raj Bhavan, is demolished. The district administration had said the school's re-construction would pose a threat to the governor's hill residence. The school, established in 1944, stood at the same place where a new building is now being made. The district administration said the top two floors should be demolished. The school's revamp is financed by the GTA under a model school project and the Gorkha Janmukti Morcha chief today said the state government was meddling in the education sector in the hills. "Education is the most important thing and the state government has started interfering even in this issue. 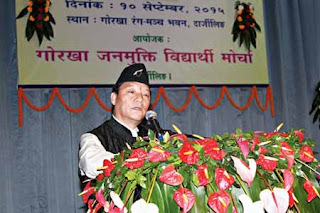 I will resign within 10 minutes of demolishing of the structure," Gurung said today at a belated Teachers' Day event at the Gorkha Rangamanch Bhavan. For the record, no building or portion of any building has been demolished by the district administration. The school is among five under-construction buildings in Darjeeling town to be issued notices by the subdivisional officer to stop construction. The order was issued as doubts arose over the legality of the constructions. Four blocks with three floors each were being built for the school. The notice issued on August 26 by Darjeeling police states: "Two of the buildings are adjacent to the Mall Road opposite to the Raj Bhavan complex. The height of these buildings is above Mall Road and seriously compromise the security of the Raj Bhavan." The order told the school: "You are requested to immediately take up the matter with the appropriate authorities to ensure demolition of the top floors of the building near the Mall Road." The school has nothing to do with the Ramakrishna Mission. A hearing was held for the five buildings on September 7 but no decision was taken by the SDO. Another hearing will be held and the date is yet to be fixed. Sources in the district administration said no further action would be taken with regard to the five buildings until the hearing was over. The district magistrate couldn't be contacted. The SDO has also clamped prohibitory orders against the construction of any new building, except with due permission from a magistrate, along East Jawahar Road between Gorkha Rangamanch Bhavan and the Himalayan Mountaineering Institute. These steps were taken after chief minister Mamata Banerjee, during her last visit to Darjeeling, expressed her annoyance over the number of highrises in the hills. Gurung had expressed his unhappiness over the state's alleged interference in the functioning of the GTA and threatened to start an agitation over the school issue yesterday. He had resigned from the post on July 30, 2013, to launch the statehood agitation but again took oath as the GTA chief executive on December 26 of the same year. Gurung today stressed the importance of education. "I will not allow the state's interference in the education sector. Using central funds, we are currently constructing eight model schools by spending anything between Rs 7 and Rs 9 crore in each of the projects. Bijanbari Degree College's construction is also scheduled to be completed in October-November. We are spending Rs 26 crore to set up the Nepali Academy in Darjeeling," said Gurung. On the sidelines of the meeting, Gurung also said he would leave for Delhi on September 14, the same day chief minister Mamata Banerjee would be visiting Kurseong to lay the foundation of the Himalayan Centre of Presidency University in Kurseong. "I am going to Delhi for personal reasons," said Gurung. Sources said Gurung would be attending a cultural meet in New Delhi on September 16.